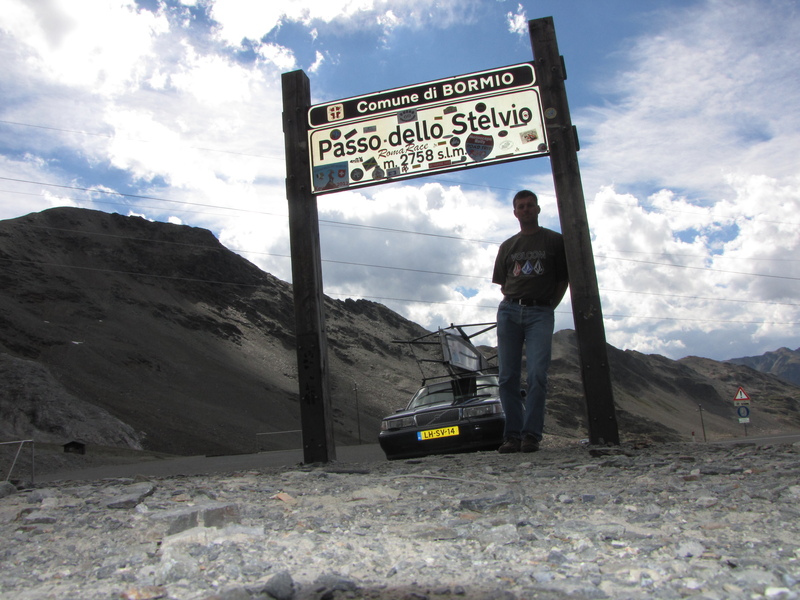 Not sure why I wanted to drive the moth up the Stelvio, but I did it. 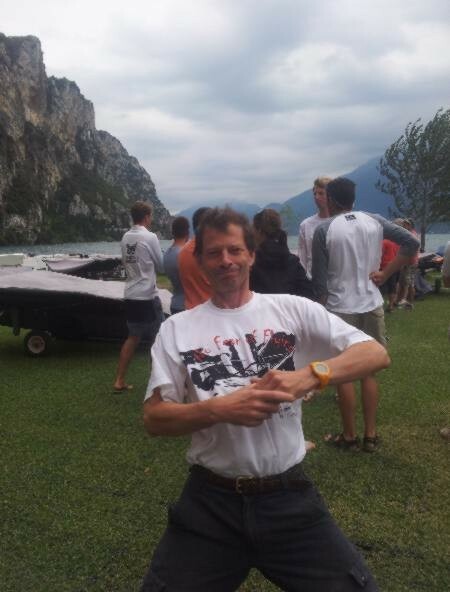 After an up and down worlds I felt like doing another regatta, and Kai from Germany was interested to buy my boat. So, off if was this weekend to do the Schlei regatta with the German mothies. It’s 450 km drive to the Schlei, so I took a friday off to make it a bit easier and maybe have a sail on friday evening. Travel was horrible. Traffic jam at Bremen, then at the Elbe tunnel in Hamburg, and, to top it off a tire of my trailer decided to explode 60 km off the destination. Slight panic, as I’d wanted to replace the tires, and the garage told me it wasn’t possible without a saw, to make room to get the wheels off. Noooo! So my first thought was: I need a hacksaw. By now it was 19.30. First place where I could stop off the Autobahn was at the highway police. With the dubious homebuilt state of my trailer that was not where I wanted to stop! A call to Manfred brought some relief. We’ll come and rescue you. That was good news. I love the mothie spirit. Harald from South Germany was still to pass by, but a phone call to him learned he was still 8 hrs drive away (uhm, a bit of a calculation gives him an ETA of 4 am. Wow, that’s determination to get to a regatta…) It all turned out to be a bit of a false alarm, as the wheel came off with the right tools and a lot of cursing, and the spare just went on without cutting up the trailer. Uf. A bit of air in the new tire, then time for a good glass of whisky (Jura) and catching up on the Garda story at Manfred’s place. Then saturday, regatta day. 11 boats turned up, with many new faces for me. In Germany the oldskool mothie spirit is still alive, with Harald’s homebuilt boat, Mathias with a lowrider (Felix’s old boat), and Niels and his friend who boat a Bladerider together, and were having a blast learning to sail the boat (good going guys!). 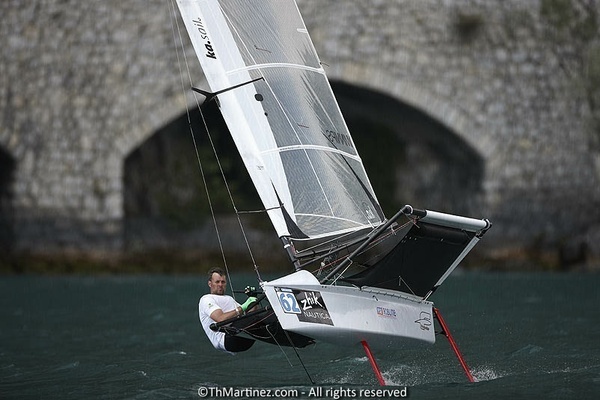 The conditions were my favourite: marginal foiling with puffs going in and out. It was very interesting sailing with a short course, many turns, and the winds quite shifty. Good for the ego too, as I could sail near the front of the fleet for once (going to the worlds helps…). I even won a start (screwed up the beat straight away), then did another touch and go foiltack. After saturday I was placed 4th, to drop back to 5th on Sunday, as I didn’t sail to sell my boat! Kai made a test run on saturday. He did fine even as I spoilt it for him as I forgot to link up the foil when I helped him on the water. I was watching, first; please don’t hit the rocks. When I saw he did ok it turned into: please foil. But without the foil linked, sigh… Kai is fit and young, so he should catch up fine with the boat. For me it’s time to move on. I have seriously considered getting into another class, as I had some of the same feelings Doug had. But after some considerations: there is nothing offering the same thrills for the money as a moth. Yes, it is expensive. But what boat offers the same speed? Excitement? Going the keelboat way and race on the sea could be good (I live on the coast), but hopefully I can still do that when I’m 60. So, roll on the new boat! So. Good weekend, great hospitality from Manfred, and met many new faces. Good fun. Oh, then the car had a flat tire, after 2 hrs (!) of traffic at the Elbe tunnel. Bah! – preparation was fun, but what I did to prepare was nothing! Yes, I’ve been more serious then ever, but what I did was nothing. – It is bloody cold in the Netherlands, and I’m still hungry. – My body feels good now. I’m happy with my preparation focus: be fit, don’t fuss with the boat too much. In this way I could enjoy the racing. – It’s been ages since we had 7 moths from the Lowlands competing at a Worlds. Then to imagine that I was the only Mothie left here back in 2008: we’re getting a good group here. – Proud I did it, very proud of some Thierry Martinez pics, and proud of the third day of the qualifiying series. Making it round in big winds and waves in the morning (with many boats not going out, or having broken stuff), getting a heatstroke during lunch, then recovering just in time to get rid of the “ambulanca” (“you want to go sailing don’t you?”). I made the afternoon’s racing, but wasn’t sure where I was. My focus of the last number of years was to keep flying in all winds, and just make it round. That worked, getting fast may be a next goal. – On a better note: the foil tacks are coming along! I did three more or less foiling ones now, it is repeatable, and I can do it. I learned heaps. After my arrival on sunday I’ve had four days here now. It’s been great to be here, and good to get going before the worlds start. But, to be honest, today has been a bit disheartening. 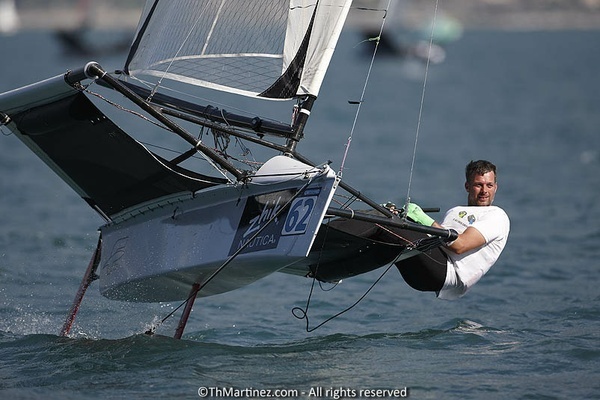 Not that I’ve been expecting to win the worlds on a five year old Prowler, but having sai;ed ok, and having to pull out all stops not to come last was uhm, horrible, I don’t think I sailed bad today (all my gybes were foiling) but I was just dead slow. Not good, and not a happy camper here. I’ll focus on my upwinds. I’ve found height now, I’ll try to switch between modes better, and will line up with some people to see what works best. Then, the tacks are getting better and better, so I might start to pull off foil tacks somewhere during the week, that could be a bit of a weapon on my end of the fleet. Then the starts need work too, doing it more, and just mixing it with the guys up front will make them better I guess. The first few days of sailing were fun. Going out with Constantijn and Chris. Had a collision on day 2, which was a bit of a shocker, but nothing broken. I was the right of way boat, but maybe I shouldn’t have tried to start avoiding. But it all went very fast, so it’s hard to think clear at those times. Just a reminder to keep your head out of the boat more. I sailed in to check things, then went out for some more hours. 10 knots of wind, sunshine, ah well, check the video, if you’re not here, you’re missing loads! It’s great to be here, but now I’m sure the boat needs to go!